Big Reveal: Oakland Unite Report! I’ve been waiting patiently for this reveal. 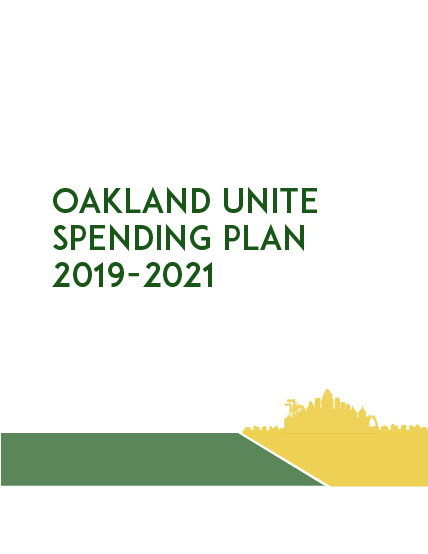 This Fall, The City of Oakland reached out to me to create a report for Oakland Unite’s two-year spending plan. It was my first time working with The City (or The Town), the first time I was asked to submit a proposal and won, and for them, the first time that they hired an outside contractor for design work. The collaboration was wonderful. THE DESIGN: They wanted something beautiful and clean, that would appeal to the City Council members, as well as youth, their community partners, and the people of Oakland that they work with. This section of the Department of Human Services, is full of community activists and folks who are very connected to the community. They really wanted something that could be accessible to the varied audience. The color scheme was a play off of their logo (Oakland A’s colors), and the complementing colors were chosen to be fresh, and welcoming. The design was really founded in the community that they are a part of. Oakland Unite works with grassroots and community organizations to implement violence intervention programs. They support the families of homicide victims, act as go-betweens for police and community, have youth mentor support, and many other important programs (which you can read all about here). Basically, they do good work, and as a 16+ year resident of this city, I was beyond honored to work with them on this project. If you’d like to see the whole thing, you can use the tinyurl link to download the plan.